For the last couple of weeks I have been enjoying an online reunion with some of my friends from seminary days. 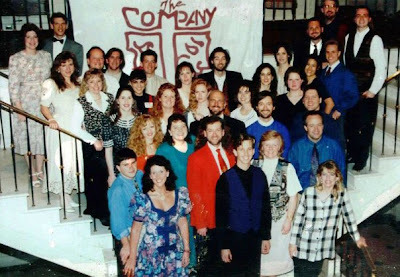 We were all part of the seminary's touring drama team called The Company. Someone started a Company page on Facebook and it all grew from there. We all started congregating, sharing stories and pictures and just catching up. It's been great. Since then, my good buddy Jon has created a private Company site for us. So, in addition to the Facebook page we now have a site of our own for sharing stories, pics, videos and what have you. I would have to say that the seeds of this were sown a year ago (actually 2 years - thanks for correcting me Jon) when our friend Bill Reese passed away. Since then, we've been more in touch and more dedicated to tracking down those who have "disappeared." We hope to pull off a reunion in 2010. The picture above is from the last reunion in 1995. If you're on Facebook, you might want to look us up, see the pictures and read the wacky stories and comments about our adventures on the road. It was a fun, frustrating, freaky, fabulous time in all of our lives and I don't think any of us would trade it for anything.